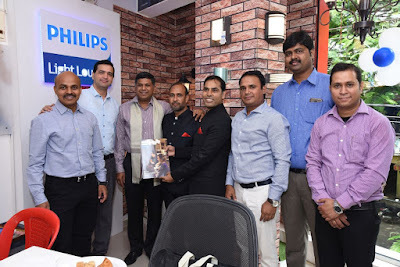 Expanding its retail presence in South India, Philips Lighting, a global leader in lighting, today inaugurated its 10th Philips Light Lounge in Bangalore. This is the company’s 69th Light Lounge in South India and is an exclusive showroom displaying a wide range of home decorative products from the company. The store was inaugurated by Sumit Joshi, Vice Chairman and Managing Director, Philips Lighting India and Ashwath Narayanji, MLA, Malleshwaram Constituency. Spread across an area of 400 square feet, this latest Philips Light Lounge showcases an impressive display of over 600 world-class home decorative lighting products and concepts that have been designed keeping in mind the lighting needs of Indian consumers, home décor trends in the country and the emerging concept of connected ambient lighting for homes. The store extensively features Philips Hue - the world’s smartest web-enabled LED home lighting system. By emulating actual home settings of a living room, bedroom and a dining room, customers can experience first-hand the light settings and recipes to suit different parts of their day. Through their live demonstration zones, Philips Light Lounges enable customers to get a first-hand experience and choose lighting products that match their individual design tastes and requirements. The company differentiates its offerings through innovation in design, energy efficiency and its global lighting application expertise. With the launch of the latest Philips Light Lounge in Bangalore, the company now has more than 180 Light Lounges in India, in addition to LightSTUDIO’s. This new Philips Light Lounge is located at Shop No - 560, Yashwantpur Main road, Bangalore.